Hailing from Manipur, this young lissome lad was an instant hit in Indian colours when he was preferred over the likes of Sunny Dhaliwal. Despite his supple stature, this lad was a giant between the sticks and gained traction as he went on to save some sizzling shots from his counterparts. Another riveting facet of his which made him as one of the most hankered-for custodians was his aquiline reflexes. Given his age, his movements in the box were indeed noteworthy and his prowess in one-on-one situations was of tantamount brilliance. Post the U-17 World Cup, in order to enrich the colts with experience, AIFF decided to field the Indian U-17 contingency in the ongoing I-League under the moniker of Indian Arrows. Dheeraj Singh was a standout among all the Indian Arrows players and exhibited consistent excellence under the woodwork. However, towards the end of the league, he decided to part ways with Arrows despite adjurations from his gaffer, Luis Norton de Matos. At the end of 2017, Dheeraj was offered a trial at Scotland club, Motherwell FC and subsequently a three-year contract at the club after some impressive performances in front of its preceptors. However, given Dheeraj's status quo, ascertaining a work permit was always going to be a Sisyphean task for Motherwell FC. As per FIFA's regulations to obtain a work permit in the UK, a player will have to feature in at least more than 75% of his country's international appearances over the course of last two years. 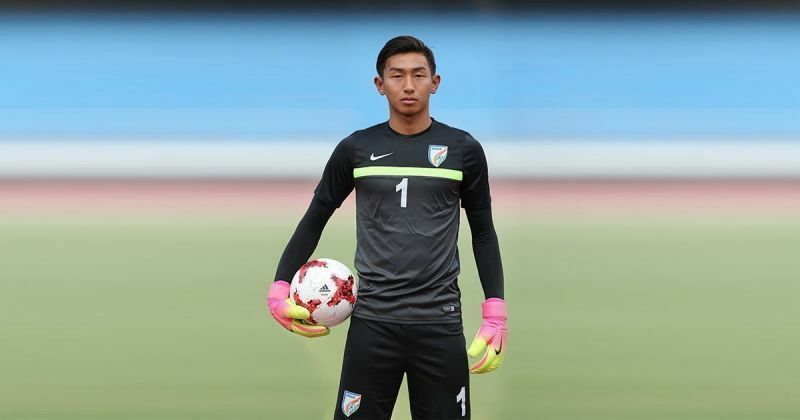 With Gurpreet Singh Sandhu, Subrata Paul and Amrinder Singh duking it out at the topmost level, this prospect seems to be in deep waters for at least a few years. The second criterion states that the country which the player is representing in the course of the two years must be in the top 70 FIFA rankings. India's current position is 99. This pretty much sealed the fate of this talented youngster's move to Motherwell FC. Motherwell FC hoped that FIFA would make some exceptions given the prowess of this young sensation from India, however, was disappointed to find out that the apex body of football was not willing to tweak its regulations under any condition. Post his trial stint at Motherwell FC, Dheeraj Singh got an opportunity to train with Bournemouth FC on the recommendation of David James. James was in constant touch with the coaches of Bournemouth FC in order to monitor the progress of the Manipuri lad and was pretty happy to know about his progress in the new ambiance and was thrilled to know about his developments with the new techniques. James also expressed his joy at Dheeraj joining Kerala Blasters and wished him all the best for his national team ventures. Dheeraj himself articulated his mirth at being roped in by the Blasters citing, "I am delighted to sign for Kerala Blasters. I had an opportunity to train with the club in January before traveling to the UK. I am really excited to work with David James and play in front of the best fans in the country." Varun Tripuraneni, CEO of Kerala Blasters was delighted and stated, "We are delighted that Dheeraj Singh has joined us. He is an exciting young talent and with David James at the helm, Dheeraj is under great hands. We have a good young squad shaping up for next season and seasons ahead and Dheeraj will play an important role as we build the squad for the future ." It will be an interesting contest between Dheeraj and Paul Rachubka as the latter is teeming with experience and has shown great panache being the final guard of the fortress for Kerala. However, Dheeraj has never shied away from any challenges and will pick up the gauntlet rolled at his feet with pride. Can Dheeraj succeed Gurpreet to serve India between the goalsticks?